The Reunel Extreme Heavy Duty Rear Towing Bumper and Rear Winch Bumper is perhaps the strongest rear bumpers on the market. The Reunel bumper attaches directly to the frame and takes the place of the OEM tow package. 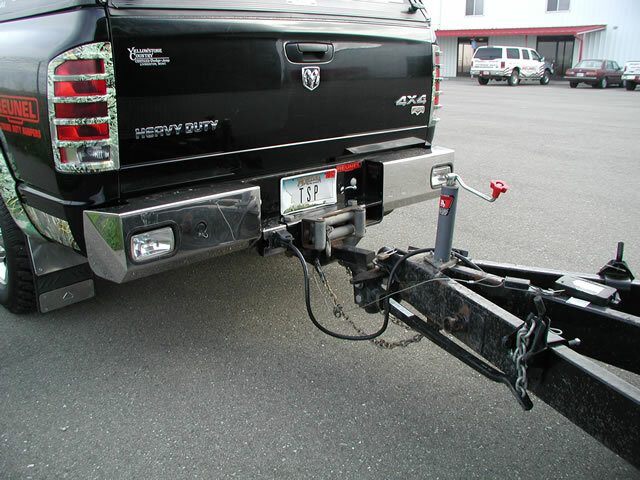 Towing hitch capacity is rated to tow 20,000 pounds and delivers a 6,000 pound tongue weight. 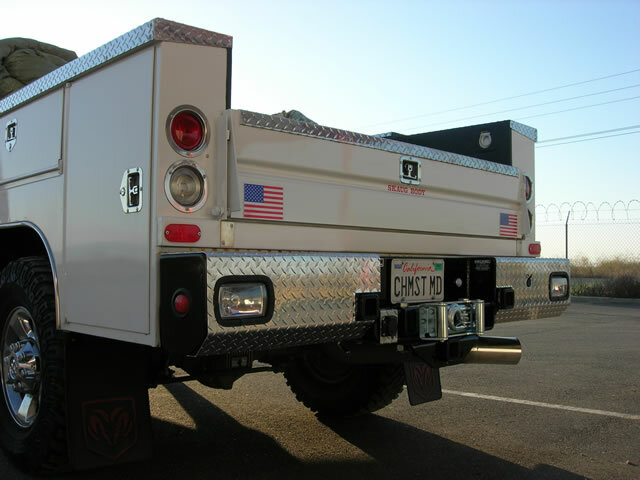 The hand crafted bumper is manufactured from top quality US steel with solid half-inch thick steel mounting system wrapping the frame from both the side and underneath and reinforcing the vehicle host frame. The exterior channels of the bumpers are quarter-inch thick plate US steel. Reunel uses a top quality two coat powdercoat finish to ensure maximum durability and quality appearance. Special features, such as relocation of the vehicle trailer plug to a protected location between our signature double half-inch steel center hitch area and grade eight hardware, guarantees Reunel customers the most efficient rear collision bumper and towing hitch system possible. Reunel extreme heavy duty stainless steel rear bumper channels are manufactured from type 304 stainless steel plate, hand polished to a mirror finish. The Reunel stainless steel rear bumper delivers the same extraordinary towing capacity and rear end collision protection as our famous painted steel bumper. 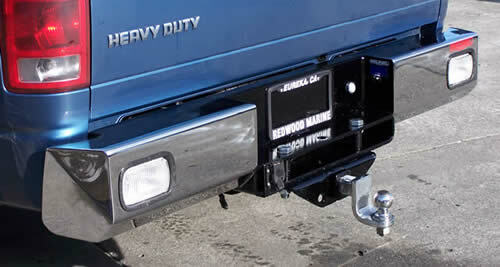 The signature double steel center hitch area of the stainless steel rear bumper is manufactured with two bars of half-inch thick mild steel coated in black. 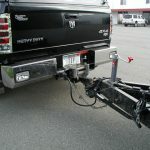 Reunel offers two different female receiver hitch options. 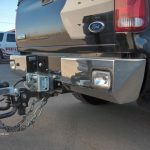 The standard welded-in female receiver hitch, rated at 20,000 pounds towing with a 6,000 pound tongue weight, is the strongest of the two options. 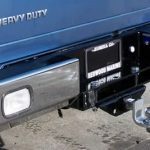 The receiver is welded between the two half-inch thick center hitch bars of the bumper and offers greater ground clearance than the OEM hitch that hangs below the bumper. The Reunel bolt on bottom mount receiver hitch is often the better choice for extraordinarily lifted trucks and/or rear winch bumpers. Call 1-800-338-2077 for additional information about this product or use our online Quote Request Form to have a Reunel sales rep answer all of your questions. Click any image to enlarge or view slideshow. Click each topic below for more details on each option. 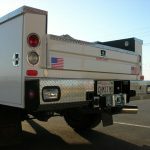 The Reunel rear tow bumper with the class 5 welded receiver is rated at 20,000lbs with a 6000 lb tongue weight. 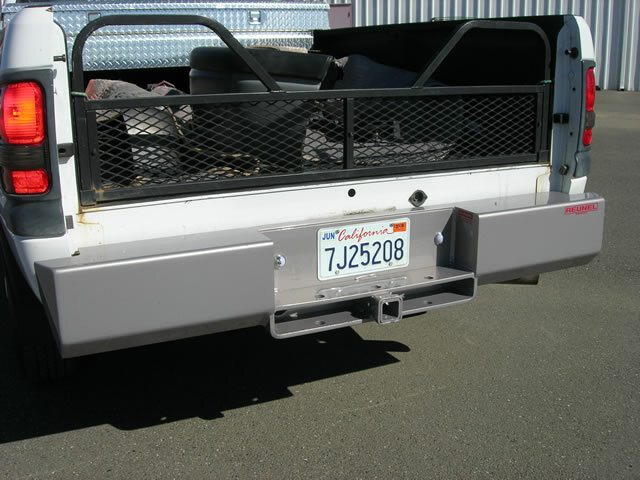 All Reunel rear bumpers are made from 1/4″ plate, and the interior plate and mounting system is 1/2″ steel plate. 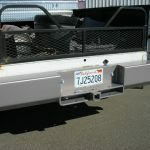 The bumper uses the existing frame holes and no modification needs to be done to the vehicle. 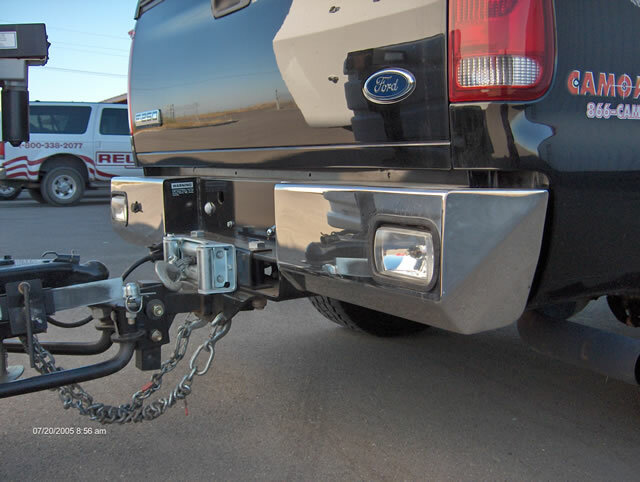 Reunel offers a class 5 bolt-on receiver hitch. The bolt-on hitch is rated at 15,000 lbs with a 6000 lb tongue weight. Unless you have a specific application in mind, the welded receiver is the better choice. Backup light holes are inset inside of the bumper, and are designed for a variety of square, round, or rectangular lights. Many of the lights seen in the pictures are a John Deere 4×6 halogen ty15870 light. 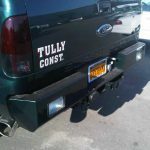 Reunel offers diamond deck plate on top of the bumper, and we offer full diamond wraps around the bumper channels. Diamond plate and wraps are the polished aluminum type. We do not offer stainless steel wraps or plate on top of the bumper. Reunel rear bumpers accommodate backup sensor mounts for all vehicles that have factory-installed backup sensors. Reunel offers both the spare tire carrier and a can carrier. Tire carriers deliver a large amount of force on the rear bumper and do everything possible to rip themselves apart. The Reunel swing away is very strong considering that the bumper attaches directly to the frame with a ½”thick plate structure. The swing arm pivots on a 1-3/4”double bearing, greasable spindle. The opening and closing latch is of a very convenient car door style. It can be opened with one hand and slammed-shut.